Once there was a mermaid who longed to know of more than her ocean home and her people. One day a fisherman trapped her in his net but couldn’t bear to keep her. But his eyes were lonely and caught her more surely than the net, and so she evoked a magic that allowed her to walk upon the shore. The mermaid, Amelia, became his wife, and they lived on a cliff above the ocean for ever so many years, until one day the fisherman rowed out to sea and did not return. P. T. Barnum was looking for marvelous attractions for his American Museum, and he’d heard a rumor of a mermaid who lived on a cliff by the sea. He wanted to make his fortune, and an attraction like Amelia was just the ticket. Amelia agreed to play the mermaid for Barnum, and she believes she can leave any time she likes. But Barnum has never given up a money-making scheme in his life, and he’s determined to hold on to his mermaid. It’s one thing when an author you haven’t read before disappoints you with their book. It’s another thing entirely when an author you admire lets you down. Christina Henry is my go-to author for dark retellings. ALICE, with its horrific world-building and tormented characters took my heart by storm. LOST BOY redeemed the story of Peter Pan for me, a character that, despite the way he is portrayed in kids’ books, I’ve never believed to be at all innocent. Christina Henry is someone who made me want, for the first time in my life, to read horror. That is why I am astonished right now. I did not think I would ever not look forward to one of her retellings in the future. I decided to read this specific one without looking at the ratings or reviews, so I didn’t have to ‘‘manage’’ my excitement. Maybe I should have, but I trusted Ms. Henry to deliver. Despite my heavy heart, I don’t believe this to be a bad book. It’s not exciting. It’s slow. It’s not memorable. It never quite goes THERE. It never quite manages to be the extraordinary story it seems to promise. And the characters. Peter Pan and Hook are characters Christina Henry was able to somehow breathe life into in LOST BOY. This mermaid and her ‘‘master’’ are just… there. Just part of the story, but they didn’t ‘‘make’’ the story for me if that makes sense. The writing is elegant, and arguably the best element here. Nothing really stands out, except perhaps the inclusion of a mermaid to begin with, since these are creatures not so popular in adult fantasy. So this is a miss. But surprisingly, as I’m writing this sentence, I’m not unhappy anymore. Saying all of that made me realize that I’ve said this before about books from authors that are my absolute favourites, and yet those authors were able to steal my heart again. I’ve changed my mind, I’m sure the next book Christina Henry publishes will be a winner and I am, in fact, looking forward to it. Okay, I’m not ‘‘sure,’’ but I am hopeful. 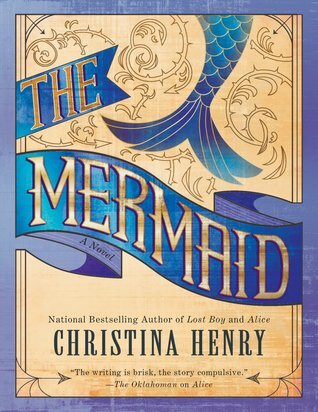 Oh no… I love Christina Henry’s dark, captivating retellings and The Little Mermaid is my favorite Disney film so I was really looking forward to this one. I had such high hopes too!